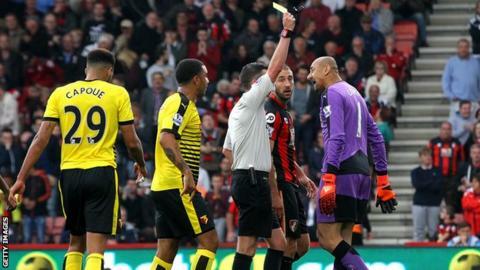 Watford have been charged by the Football Association after the conduct of their players in Saturday's Premier League draw at Bournemouth. Some players were unhappy with referee Michael Oliver after he awarded the Cherries a late penalty. Glenn Murray's spot-kick was saved by keeper Heurelho Gomes as the two sides drew 1-1. The charge relates to "surrounding the match official", the FA said. Watford have until 18:00 BST on 12 October to respond. The Premier League introduced new guidelines for this season stating clubs would be charged if two or more players approached the match official in a "confrontational manner".